As its name suggests, Airplane Mode is designed to turn off communication features such as Wi-Fi, Bluetooth, and cellular data, which take power because they periodically check in with the network. If you’re using your iPad for purposes that don’t require communication, turn on Airplane Mode by tapping Settings and then tapping the Airplane Mode on/off button. Also, Control Center lets you quickly turn Airplane Mode, Bluetooth, and Wi-Fi on and off. Swipe up from the bottom of the screen to display Control Center. 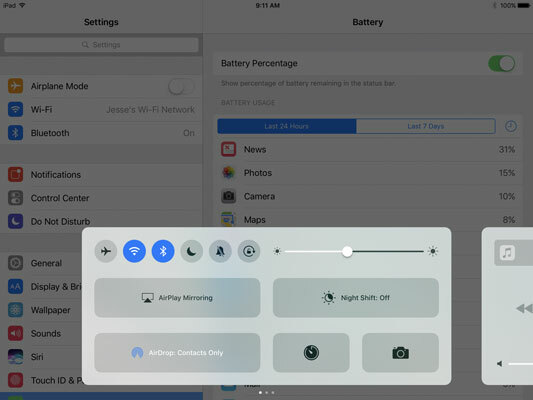 Control Center lets you quickly turn Airplane Mode, Bluetooth, and Wi-Fi on and off. Many airlines now allow the use of Bluetooth and/or Wi-Fi during flight so Airplane Mode may not be as necessary as it once was, but it’s still needed (usually) during take-offs and landings. In addition to its aeronautical uses, Airplane Mode is the simplest way to conserve power, and if you want to concentrate on something, it may be a simple tool to use. You might want to turn off this setting (tap Settings→General→Background App Refresh) for some of your power-hungry apps if you don’t need them to run in the background. News, for example, routinely checks for updates. If you’re feeling stressed by too much connectivity, try turning off background refresh in some noncritical apps. Keep tabs on remaining battery life. You can estimate the amount of remaining battery life by looking at the Battery icon at the far-right end of the status bar, at the top of your screen as you see in the figure. Use standard accessories to charge your iPad most effectively. The most effective way to charge your iPad is to plug it into a wall outlet by using the Lightning-to-USB cable and the 10 W or 12 W USB Power Adapter that comes with your iPad. The fastest way to charge the iPad is to turn it off while charging it. Don’t keep your iPad connected. Your battery may lose power if you leave it connected to the USB port on an external keyboard. Your iPad comes with a USB Power Adapter. With the variety of devices, Apple now has a guide to adapters here Apple.com. Your best bet is to use the adapter that came with your iPad. If you have another adapter, refer to Apple’s page cited here, but if it’s an Apple power adapter, you’ll be safe. If you use a smaller power adapter than the one that came with your iPad, you’ll probably increase the charging time, but you shouldn’t do damage.